Our work aims to be emotional, intimate and timeless while still capturing the genuine relationship between each couple and their loved ones. When you look at our work you should feel connected to the people and their story. How many photos will be in black and white, and how do you decide? Typically around 20%-30% of a full wedding gallery will be delivered in black and white (unless otherwise requested). We make the decision based on lighting, mood and often the repetitiveness of images. If we've taken two great photographs that are similar we'll often deliver one in colour and one in black and white. Do you travel for weddings and other photography assignments? We sure do! Wherever in the world, you choose to get married, we would love to join you there. The cost for a destination wedding differs largely so we highly recommend you contact us for a custom quote, include as many details as you can! We are based in-between Ottawa and Toronto and shoot the majority of our weddings in those two major cities, as well as the smaller area’s surrounding them. We also frequent British Columbia because we can’t get enough of the ocean. 600+ is typical. You will receive high-resolution images, edited similarly to the style featured in our portfolios. How long will it take to see our wedding photos? Why does it take so long? We have a 6-week maximum, however, 4 weeks is typical. This is simply due to the time and care we take to fully edit your beautiful wedding images. Our usual booking process is a consult via phone or skype. We love hearing all your wedding details and making sure we're the perfect fit for your day. A 20% deposit and a signed contract are also required to reserve your date. We focus very heavily on capturing couples and consider that our specialty, though we do occasionally shoot other types of portraits during the off-season. We'd be happy to chat about any of the following - Engagements, Bridal or day after portraits, Boudoir, Headshots, Lifestyle Newborn, Families, and even Furbabies. What publications are your work featured in? Kym was recognized in both 2015 & 2016 as one of the Top 30 Canadian Wedding Photographers Under 30. 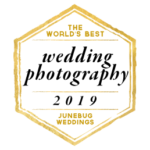 As well as having been featured on several international blogs including Junebug Weddings, RealWeddings Rustic Folk Weddings, A Practical Wedding Blog & Popsugar.